How Do Math and Music Mix in a Music Classroom? Most people I know, both teachers and non-teachers, musicians and non-musicians, believe that students use a lot of math concepts when making music. In the current environment created by core curriculum state standards, this belief can easily lead to the desire for music teachers to explicitly teach, or at the very least reinforce math concepts in music classes. 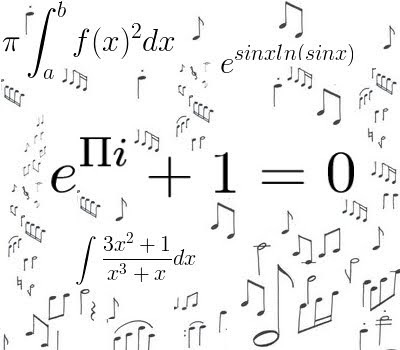 Music is math and science in action. When you hear a pitch, it is a certain number of vibrations per second, and it is comprised of a certain mix of harmonics that form the timbre of the pitch being heard. Double the frequency, and you hear an octave higher. Half the frequency, and you hear an octave lower. In both cases, our brains recognize the same pitch class, and treat the pitches as if they were the same. Other frequency displacements result in either consonant intervals, such as a perfect fifth or major or minor third, or dissonance intervals, such as the perfect fourth, major or minor second, or the augmented fourth/diminished fifth, the so-called tri-tone. We also tend to hear as more pleasing and satisfying musical events that are most familiar to us. As a result, things that happen often are heard as more pleasant than things that rarely happen. Pitches, consequent chords and pitches, metrical patterns, rhythms, and phrase lengths that occur most frequently are heard as more pleasing than those heard less frequently. We expect to hear intervals that take us further from the most frequently heard pitch to be followed by a note that brings us closer to the most frequently heard pitch. This is a statistical principle called regression to the mean. Rhythm is frequently cited as the connection between math and music. Rhythms are patterns of durations, measured over time. The brain organizes rhythms into groups of beats, each of which occupies an identical time-span. Those beats are organized into meter, which is a pattern of strong and weak beats. All of this occurs over time, measured in a hierarchical structure of beats; hierarchical because a beat can be one note of any value. There can be a beat of one quarter note, one half note, one whole-note, two measures, four measures, and so forth. When a conductor decides to conduct a piece “in one” he or she has decided that the beat will be measured in a note value equal to one measure of music. The math at work should be evident. Ratios of durations are always present in music. A beat, however defined, is divided into a number of sub-beats, usually two or three, resulting in duple or triple meter. It is not necessary, or even appropriate for me to teach all of the math behind the musical sounds my students hear and make. I do make them aware of duration relationships, and metrical patterns. I will even explain that the reason a whole note is called a whole note is because it is a duration that lasts a whole measure. It is enough for them to know what they are hearing and feeling. Knowing that they are hearing and feeling 2:1 duration ratios while listening to music in simple duple meter gives them a name to remember the experience by, and an experience with which to remember the concept. That is very effective math pedagogy without my ever overtly teaching math in place of music. Nobody makes or hears music in fractions. We may find it tempting to explain rhythm with fractions, and to give our students worksheets for them to sum note values with whole numbers and/or fractions, but this is not teaching music. It s purely math, and it perpetuates the myth that music making is a matter of counting. Let me be clear: it is not. Students naturally sense the durational hierarchy, whereas the counting in unnatural and therefore more prone to error. Let the math teachers teach fractions. They are not musical. When we bring math vocabulary into our music classrooms without diverting our attention from teaching music, we are reinforcing math concepts while preserving the integrity of our programs. ← What Are Some Ways To Handle A Small Music Classroom Budget?